Ravenna is typical of many of our more northern sight seeing destinations this year: it is a ‘second tier’ or less famous sight. I’d never even heard of Ravenna until our travels nudged me into reading history books and it was a name that kept coming up. Like many other cities including Pisa, Ravenna was once a port city but is now well inland due to deforestation and the subsequent heavy silting of the rivers. Ravenna keeps coming up in the history books because it was the last capital city of the Western Roman Empire (402-476). The emperor abandoned Rome to the barbarian invasions and took refuge in the malarial swamps that included what would become Venice. After a few decades of possession by the barbarians, the Byzantines retook Ravenna as a regional capital and other, constantly varying parts of Italy. 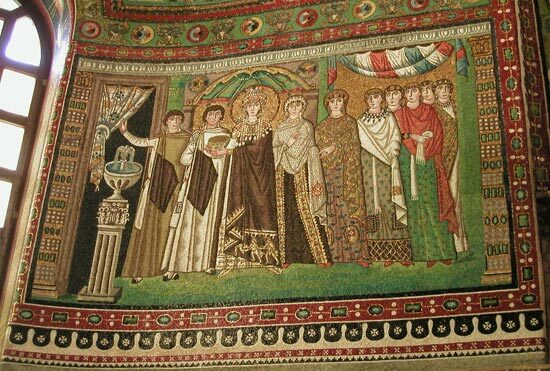 Like the Romans, the Byzantines went on a building spree when they arrived in Ravenna and lined their churches with stunning tile mosaics or ‘tessera’. It was these mosaics, mostly from the 500’s, that we came to see in Ravenna. Religious art generally doesn’t hold my attention for long but I was spell-bound by the Ravenna mosaics. We spent an afternoon going from one 1500 year old building to the next with our mouths agape as we stared at the ceilings. The vibrant blues and greens of the glazed mosaic tiles were captivating and the gold leaf tiles and splashes of red set it all a shimmering. Old and New Testament stories were retold over and over, which served to inadvertently reveal the stylistic differences between the naturalism and realism of the late Roman Empire artists and the stiff frontal and more symbolic representations by the Byzantine artists. These mosaics were like looking at an awesome sunset: you don’t want the experience to end and yet it isn’t anything you can hold on to. One of our other thrills was seeing thinly sliced and polished alabaster slabs being used as windows in a basilica and a baptistery. That was added to our very short list of Roman windows, the other being flattened, blown glass and ivory that we saw in Patras, Greece on the day we left the country (no pictures allowed there). Aside from being Byzantine art in Italy instead of Turkey, the other oddity about these churches and mosaics is that they are so old. We learned early in our travels that if the literature says a church is from 300 or 500 or 700 that it is only the SITE that is that old for the church. The big building spree in the 1200 and 1300’s resulted in most churches being leveled and redone in the architectural style of the day. So most existing European church structures are from the 1200-1800’s. For some reason these Byzantine churches weren’t leveled and redone, which makes them all the more unusual. If you are ever headed towards Venice consider a half-day detour to Ravenna to take in these mosaics that were done a thousand years before the dazzling art of the city of canals. The technical surprise of our day in Ravenna was learning that the domes hosting the beautiful mosaics in the Basilica di San Vitale and a couple of the baptisteries were made lighter weight by the use of interlinked terracotta tubes. These terra cotta tubes are about the size of large zucchinis and were linked into continuous rings. This terra cotta framework allowed the domes to be much lighter than the 5’ thick concrete dome of the Roman Pantheon done several hundred years earlier. If I hadn’t read a snippet about these terracotta tubes as I flipped through a book in a museum shop I wouldn’t have known what I was seeing a bit later in the archeological museum where a few were on display. Less subtle and obscure than the terracotta dome tubes was the vivid illustration of a sinking building. We read over and over again about ancient buildings sinking or subsiding and new levels being built-up over old layers to compensate for the lost height. 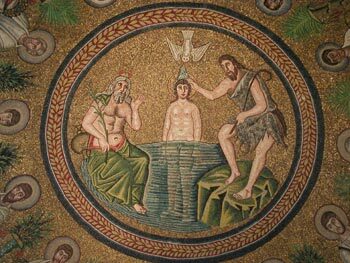 But in Ravenna the point was driven home by seeing goldfish swimming in the 4’ deep water above the old mosaic floor of the church crypt that was at one time the ground level of the 6th century church. 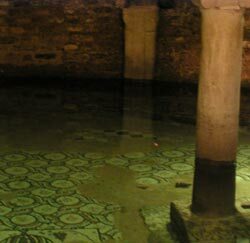 The current raised floor was installed in the 10th century at the Church San Francesco to again have a floor above the water table. We have read over and over again that the final blow to the Western Roman Empire was being overrun by barbarians in 476 with the implications being that Romans were immediately reduced to a chaotic and unsophisticated way of life. As it turns out, the barbarians weren’t so barbaric. Teodoric of the Ostrogoths, who was one of the barbarian leaders, was educated as a child by the Byzantines while being held as ‘collateral’ on a treaty deal. (Being an inattentive student to the all-important classical studies, they finally released him as a non-threat, a low achiever. What they failed to notice was that he was a excellent student of Byzantine warfare which he eventually used against them.) But Teodoric brought about a bit of a revival of civility to life in Ravenna and the Western Empire, including repairing the dilapidated aqueduct system and sponsoring a few monumental buildings of his own. We “ooo’ed and ahh’ed” our way into Bologna’s old town center as the narrow colonnaded streets and cobblestones made us feel like we had entered an ancient Roman city. The 3 and 4 storied buildings in terracotta tones occasionally broadened into small plazas allowing brief looks at the immediate skyline made jagged by taller churches and several leaning towers. The familiar-in-Italy shabby look of the facades didn’t diminish our excitement as we wondered what we’d discover around the next corner. Every couple of buildings sported interesting decorative stone or tile work around the windows or delightful details in the plaster and stucco work or some other architectural surprise. This wasn’t the cute look we’ll soon be seeing in Alpine Italy with cheery flower boxes and freshly painted shutters, this was the look of a once grand city still flashing remnants of its glory days. The central square with its medieval and renaissance buildings and palaces and the fountain featuring a bronze Neptune all seemed a bit awkward, like they had been competing for dominance with no clear winner. The huge basilica begun in the late 1300’s was startlingly incomplete as only the first ‘storey’ received its planned decorative stone façade and carvings. Niches for statutes were empty and the upper stories were of crude jagged brick waiting for the fancy stone finish that will never arrive. On our second day in Bologna we added our presence to the cluster of people taking in the shade on its marble steps. We munched on our sack lunches and reviewed the city’s history as the more fashionable folks across the plaza sunned themselves in the café chairs encroaching on the enormous open square. We spent a full day in Bologna walking the streets to ogle the facades, peek inside several churches and visit a couple of museums. 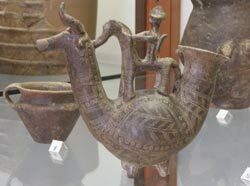 It was the archeological museum that brought us to Bologna as we had read that it had some interesting Villanovan and Etruscan finds. One display on our ‘must see’ list wasn’t much to look at but is amazing to know about: it is a large terra cotta pot recently found filled with about 15,000 bronze pieces and fragments. It was apparently a smelter’s stash of damaged axe heads, safety-pin like fibulas, and ingots being saved for melting down and reforming. None of the individual pieces displayed was particularly interesting but it was an important find of everyday items instead of the more usual archeological finds of grave goods. The Etruscan, Roman, and Egyptian (why here in Bologna?) displays didn’t offer much new but we enjoyed the history review it offered. Tracking down the suburban Bologna Museum of Industrial Heritage was an accomplishment in itself and we were rewarded with some English on the displays. We had dearly hoped it would start with antiquity instead of the 1800’s but it was an interesting slice of history nonetheless. There were desktop-sized, moving teaching models from the 1800’s of many machines, some with familiar inventor names like Morse and Watt. Many of the displayed items were the product of one Italian physicist’s quest to bring the Industrial Revolution to Italy. He traveled to Paris and Britain to learn the new technologies and established a school to train men in the new industries. The entire museum was housed inside the rooms of a brick factory kiln used into the 20th century. When we were in Urbino deciphering the weathering bas reliefs and guessing the functions of the machines we couldn’t help but think of how primitive some of them were in the years so close to the Industrial Revolution. The Bologna exhibit helped underscore that the industrial revolution arrived late in Italy and had several regressions back to cottage industries along the way. The steam engine was slow to gain acceptance as it competed for water with their canal-water powered mills and attempts to educate and train the needed machinists suffered several failures. Bill shared his knowledge of the workings of hydraulic pumps and steam engines with me and together we studied the intricacies of Bologna’s all important silk mills and giant brick kiln. The museum was only open 3 hours and even without being able to take in all the Italian written and audio descriptive material we needed more time to see it all. I was most fascinated by the low-tech process of making terracotta façade pieces and giant pots using heavy moulds—a process we imagined hadn’t changed much since Roman times. The museum highlights for Bill were seeing the replicas of Watt’s steam engine and learning that the Industrial Revolution didn’t just seep into Bologna but it had to be dragged in, kicking and screaming. It required diligence and ongoing effort by a lot of people over close to 100 years to get it ‘to take’ in Italy. One treat for us in Bologna was that we had to stay at an expensive hotel. Low end here is $80-85 and the tourist office found us a lovely 3 star hotel with carpeting and colorful décor—things we haven’t experienced in Europe so far this year, for $93. (We were lucky to be in town between the frequent conventions and benefited from heavy discounting by the better hotels.) CNN on the TV, a refrigerator, a shower that contains water and is big enough to bend over in, a substantial breakfast, and an internet-compatible phone all did their part to take the sting out of the high price. The price looked even better when the woman at reception that we asked to phone-verify our Industrial Museum’s hours did so and also gave us discount coupons for a total of $16 in savings at 2 museums. Most hotels in Italy have run about $50 a night but by the time we left we were pleased with our ‘vacation’ in nicer digs and the goodies we received for the premium. So often when we have to pay more in an expensive town we don’t end up with anything nicer. Biking out of Bologna was a rare day for us: we rode a respectable number of miles plus enjoyed 2 brief sightseeing stops. 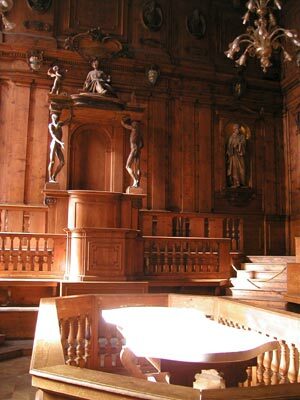 The first was in Bologna’s old town to take a peek at the 1650’s wood-paneled anatomy theatre—those places where instructional dissections were done. It was one of those experiences that only take a few minutes but transforms something that you’ve only seen in books into something very different once you’ve stood in the middle of the picture. It permanently changed my sense of what those theatres were like. We were both taken by how ineffectively far the students were from the dissection table. Anatomy is so complex, finely detailed and difficult to learn that you practically have to put your nose in it to make sense of it and yet the students were 8’ to 20’ away depending on their seat. It was hard to comprehend how they learned much, especially since they lacked modern teaching aids to supplement this remote educational experience. Our late afternoon stop that day couldn’t have been more different. This stop was honoring that part of Bill that occasionally pokes through between his serious roles as Map Man, Bike Mechanic, Team Doctor, and now Web Master—the part of him that has always loved pondering planes, trains and cars. We have unexpectedly happened across “moving things” museums in our travels but today’s was actually planned thanks to a tip from our guide book: a visit to the Ferrari museum. I don’t share his fascination with motored machines but I usually find something of interest at the exhibits and Bill fills me in on the significance of the more important models displayed. The biggest smile he could muster. But this high-admission priced gallery was surprisingly a bust for both of us. They had no more than 15 cars spread around with a few engines and precious little information (though what they had was also in English). 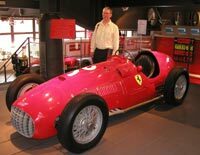 There were no familiar models displayed to rekindle Bill’s childhood memories of Ferrari’s and there just plain wasn’t much to look at. We laughed at comparing this experience with being fascinated the day before by learning about making and firing bricks in the 1860’s—they should have been able to make Ferraris exciting. I could probably come up with a 100 themes that would have piqued my interest, like learning something about their red paint, their relationship with Shell Oil or what happened to the plant during the war. It once again reminded me that my curiosity is ready and waiting to be taken for almost any ride but it does need a little intrigue from the experts—just piling stuff up in front of me doesn’t do it. Despite the wretched pollution, riding in Italy is a treat as the motorists are so mindful of bicyclists. Even on the narrow, shoulderless roads with an oversized truck barreling down in each direction we can be confident that they’ll somehow make room for us. The fearless roadie’s out on what seem to us like horrible training roads keep the driver’s skills finely tuned and the mindless commuter’s in town keep all of the driver’s alert to bikes. Map Man tires hard to keep us off the truck routes but at the times when it is unavoidable we know that regardless of how tiresome and noisy it is that the motorists will respect our place on the road. And much to our surprise, we have been encountering bike lanes in Italy. Most are in the towns with some being very low-speed pedestrian zones in the old town core. Some are so intermittent or have such rough surfaces that we finally give up and go back out into the streets with the trucks. A few of the suburban traffic circles will have raised bike paths all the way around the loop and inexplicably others are only partially set-up for bikes. A couple of times we have been jubilant at discovering bike underpasses circumventing the whole vehicular snarl at busy intersections. But perfect or imperfect we appreciate every indication of more accommodation being made for bikes by the traffic engineers. All the bike paths are well marked as being for bikes so that we know we are welcome on them once there, but that is the extent of the signage. The designers seem to assume that these paths are for ‘insiders’ only and that no directional information is needed. A few have abruptly dead-ended into concrete walls or barriers without warning and have required back-tracking. One path routed us across a bridge with no warning and no way off without turning around. And a lovely, lovely converted old rail line had no signs to indicate when we were passing through towns or the names of intersecting roads causing us to miss a turn and again backtrack. But after a sightseeing detour we again sought out this wonderful old rail route to take us to its terminus town. Parts of it were tree-lined, small sections had benches and garbage baskets, and we had brief interludes zipping along a corral of cows, slow moving canals, and ponds of noisy birds and frogs. Over and over we congratulated ourselves on our good fortune for happening along this 15 mile, well-used bike road that wasn’t noted on our maps. (And from the looks we got we can imagine that we were among the first travelers to find it.) The completely traffic-free path was a much needed respite from the busy truck routes and gave us a modicum of relief from the oppressive pollution. It is so frustrating to know that there are cloistered bike routes in this part of Italy and yet not be able to get on them. We missed the first 10 miles of a route out of a major city and would love to have been on a bike route—it would have saved Map Man a lot of effort and likely been even quieter and more scenic than the routes he came up with. As it was we just happened to intersect it and rode it for a delightful mile or 2 on tiny little paved farm roads skirting along a hillside. And even once we are on a long bike route; it can be hard to stay on it. We have been on one route twice in the last year and never can find the route again once it crosses a particular major intersection. The next entrance point is a mile or so down the road and we catch it there. These routes would be so wonderful if they would sign the entrance points to them and have signs alerting bikers to available routes. And unlike in some northern countries, there are never any outdoor signboards in the town squares or along the route to substitute for a map in your hand. One day we detoured into a town specifically because our guide book said the tourist office had some great biking maps for the immediate area but they were closed when we arrived. We left empty handed, not wanting to hang around for 2 more hours until their siesta was over. Going to Italian tourist offices is like playing the slot machines in Las Vegas as they tend to have short and unpredictable hours. There is no standardization for the days of the week or hours during the day when they are open and the degree of helpfulness is highly variable. Plus, Italy has an especially challenging system as each tourist office only has literature for their immediate political region and even at our slow speeds it is possible to be in 3 different regions in one day, which makes it impossible to do any long range planning with their information. When we finally connected with an office plump with information and a capable English speaker we were told that indeed there were biking maps made for her region but that they were no longer being printed. One recent horrible night resulted in our longest bout of sustained suffering with culture clash: our overpriced hotel that advertised quiet rooms throbbed and pulsated with the energy of 70 preteens late into the night. We had had a long day on the road enduring too many whizzing trucks and too much pollution and were definitely ready for peace and quiet, which described the hotel ambiance when we checked in. Then a half dozen kids started shouting across the courtyard from their windows. We could hear a few other kids on the ground level but only felt intruded upon by the shouters on either side of our inner corner room. It was only 7pm and we still had time to move to another hotel, but I had hoped a trip to the front desk would do. My visit resulted in a small reduction in the volume of noise from the kids after a call to the “Professor” and reassurances that the hotel would be quiet at 10. That was past our “early start in the morning” bedtime but workable. A bit later I found myself reading the same sentence over and over again, unable to concentrate because the pounding outside our door and over our heads from the kids running in the halls and the shouting all around us. I made another visit to the front desk which resulted in another phone call to the Professor. One of the little girls had been kind enough to tell me which room the Professor was in so I decided to go chat with her myself. I was dumbfounded to discover that she thought there was nothing inappropriate about the kid’s behavior and that she clearly wasn’t budging to slow down the rpms of their activity. I explained to her how I had insisted that the kids play-fighting in the hall near our room stop their rough-housing and how I had demanded that the kids shut off their radio in the open stairwell next to our room. I told her I expected her to be doing the same and she clearly communicated that she had no plans to do so. Ten o’clock came and the volume was down but it still sounded like a freshman dorm on Friday night and this was a school night for the kids. At 10:30 Bill staged a rage in at the reception desk which began a long negotiating process. They finally and reluctantly found us a quieter room and gave us a discount on the cost. We were very upset at losing our quiet evening and many hours of sleep but more profound was the culture lessons we learned and relearned. We were absolutely stunned to be told by both the chaperons and the hotel management at 11:00 pm that it wasn’t reasonable to ask 70 children to be quiet for 2 adults (never mind the other guests I guess). Though we had been reassured that 10 pm was quiet time, none of them apparently had any intention of enforcing it. “They are children” we were told over and over again. Of course, my attitude is that it is high time those kids learn the concept of “indoor voices” and how to behave in the adult world of hotels. This wasn’t a youth hostel or budget hotel, this was purported to be a 3 star hotel with quiet rooms. We have seen slices of the attitudes reflected this night over and over again in Europe. We see adults giving tacit approval to what we consider outrageous behavior: parents watching as kids trample beautiful public plantings of flowers, kids touching things in museums that are posted “don’t touch,” kids setting boxes afire in plazas, and kids being allowed to do things dangerous enough that would get them taken away from their parents in the US. There is also the general acceptance of reckless or rude behavior that encroaches on others, like the driving on sidewalks, flagrant littering, and illegal backyard burning. On the flip side, I am sure they were equally appalled at what must be by their standards our bad manners in reprimanding their children and raising our voices with our outrage. This experience again reinforced the astounding passiveness with which Europeans allow their peace and comfort to be encroached upon. We saw none of the Italians complaining that evening or the next morning and I was at the front desk frequently enough to have noticed. The other American couple checked out that morning at least a day early to the surprise of the manager. The manager’s English language skills were remarkably poorer at check out time than the night before and so I am sure that his lapse in ability curtailed any discussion of why the other couple was departing ahead of schedule. The whole incident reminded me of an international flight 25 years ago when, close to landing time, all of the by-now drunk soccer players began stripping to their underwear in their seats to change their clothes. The already frazzled and outnumbered flight attendants were beside themselves in trying to get the guys to be more culturally appropriate by American standards. It was a powerful lesson on different assumptions that even us westerner’s make about acceptable behavior. This episode with the seemingly out of control kids caused me to ponder the whole notion of a guest, wondering if that was part of the culture clash. In Turkey, an ancient crossroads country accustomed to receiving traveling traders from afar, the traveler, the guest, is eagerly received. Several times in Turkey an extra blanket (there is probably always an extra on hand) was spread beneath a tree for us to rest and enjoy a bit of the already relaxing Turk’s fruit or tea. The guest, the stranger, is actively honored and welcomed and something special is offered. In the US, the guest is kept a bit more at arms length but the best linens and tableware will be brought out for the guest, perhaps the best bed offered up. The US guest often has privileges that go beyond that of the other’s in attendance and beyond what they expect at home. The white, rural buildings of the Po Plain had indeed been pretty plain. But as we progressed towards the Alps, “Ta-Da! Look at me!” was the message more and more architecture shouted at me as we pedaled by. It started out as a whisper when I first noticed that the narrow overhanging eves were sporting just a little more detail, flashing a little more personality. Where smooth, unremarkable and monochromatic undersides of eves had been there were now just starting to be stubs of carved wood beams—nothing real fancy but a little scalloping on the under side, often accented by stained wood. This same decorative detail began appearing in stone and plaster too. While spying on the eves a few towns later on our northwestwards route I was startled by 1½’ wide borders painted just under the eves. Like the decorative roof supports, these details were 2-3 stories above the ground and seemed coy and flirtatious in their remoteness. The nicer of these borders were dimensional-looking paintings of classical looking pots and patterns, perhaps a take-off on flashy façade plasterwork of a particular era. Then in one town, someone finally did it: they painted the entire side of the building with skillfully done dimensional patterns. As we continued traveling through the old center of these villages and towns we started seeing a handful of these attention-grabbing images of a proud past. For our prior 10 days in Italy we had mainly seen very plain, box-like buildings without much color or detail so these flashes of outdoor art were a treat. And when we finally started into the foothills of the Alps the architecture cut-loose: the wisdom of the tightly contained, boxy buildings with narrow eves, no balconies and little color was directly confronted by bolder brothers. Strong terracotta and mustard tones with avocado-green shutters took-on the pervasive whites; broader eves and balconies now dared to venture beyond the narrow confines of the walls; the roof-lines became complex and multi-leveled; and decorative painting and occasionally non-rectangular windows and matching shutters demanded to be seen rather than preferring to be over-looked. 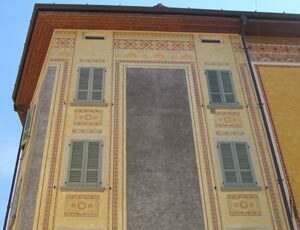 And the charming resort town of Iseo on Lake Iseo sported freshened-up Italian art nouveau wall paintings that were originally done at the turn of the 20th century. Lawns and more landscaping appeared and the increased use of rock foreshadowed the mountains ahead of us. Who’s Reporting the Weather Today? As we transition from the plains to the foothills, our ‘meteorologist’ has to make some changes too in reporting the weather. At home I eagerly tuned into “The Weather Channel” on cable TV to refine my riding attire selection for the weather day. On the road when we have had easy internet access we check the 7-day, online weather forecast to help with route planning and with what clothes to pack on top in the pannier. On Crete we surveyed the percentage of white on the ocean surface from white caps to assess the winds and weather for the day. In the Po plain of Italy we gauged the pollution intensity and forming thunderheads to predict the challenges ahead. And here in the foothills of the Alps, I’m watching the farmers covering up the huge hay rolls with a massive blanket of plastic and assume we should be expecting rain. 6/21/03 Where Are They Now? The ride from Italy to Lienz, Austria on the Drau River (not Linz on the Danube) yesterday afternoon was delightful: sunny and slightly downhill most of the way. We’ll be in Lienz a couple of days to implement our newest, most radical plan for dealing with our missing camping gear. Only 2 of the 3 boxes mailed to Cortina, Italy arrived and we had been lingering in the Dolomites an extra 10 days hoping the third box with the panniers would show up. We finally decided to ride into Austria as far as we needed to buy new waterproof panniers, then take the bus and train back to Cortina to pick up the gear. Two nights ago a new plan bubbled up, which is to take a hint from the postal service and just skip the camping this year. So tomorrow we’ll take public transportation back to Cortina to pick up the gear, put it in the mail on its way back home on Monday, and get on to Budapest. We’ll miss the cost savings and social opportunities that camping provides but enjoy being less encumbered by the extra gear.